Visitors to QRAM this week were on a mission to have the Black Star radio service extended into Normanton and Burketown. 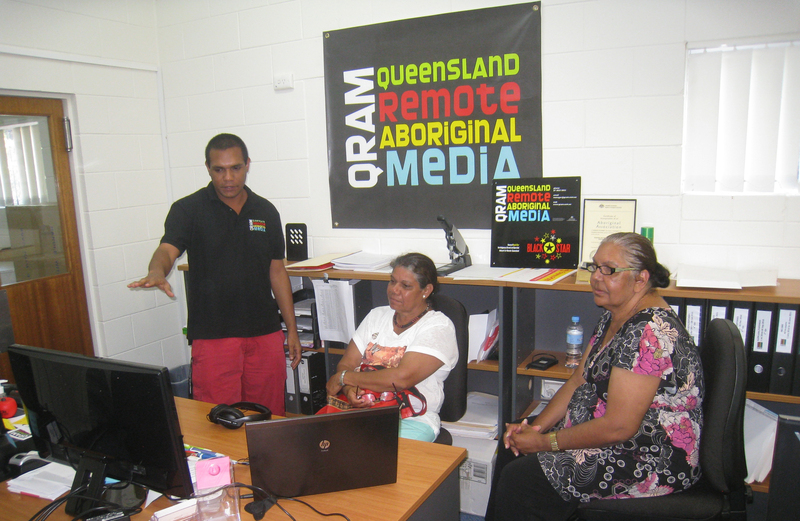 Francine George from Karumba and Susan Sewter from Mornington Island had a tour of QRAM Central with Manager Jim Remedio and were very impressed with the set up and the way we are using new technologies to operate remote radio services. QRAM’s Gilmore Johnston shows Francine George and Susan Sewter the technology behind the Black Star network. Francine sees radio services as playing a vital role in disseminating information in a ‘whole of government’ approach to closing the gap in Indigenous communities. Francine is a strong advocate for health services and told QRAM that anything that can be done to improve the chronic disease problems which are crippling the Gulf communities must be done. “A radio station in both Normanton and Burketown would also be valuable in times of cyclones, floods and bush fires and of course we love our music as well” she said. Susan Sewter comes from Mornington Island in the Gulf of Carpentaria. Susan is Lardil with other traditional ties to Waayni and Gangalidda on the mainland coast. Susan’s profession is teaching, however in 2004 she stepped down from teaching to take on the position of Mayor of the Mornington Shire Council. Susan is a strong advocate for maintaining her peoples’ culture and values that have been passed down through the generations. For Susan radio is a vital part of community life and a good way to get information to people. Susan says that we should use every means possible to get information to the community. Normanton used to have a BRACS service in the early days, but it dropped off the radar many years ago. With this renewed interest, QRAM will assist with licence application, frequency, engineering and do a site trip to meet with people eager to resume the radio service.